Americans do not capitulate easily to adversity, which is why President Bush's elegy last week--and his stirring promise to rebuild--comforted us. "Americans want the Gulf Coast not just to survive, but to thrive; not just to cope, but to overcome," he said, standing in front of the St. Louis Cathedral in New Orleans, my hometown. "We want evacuees to come home for the best of reasons--because they have a real chance at a better life in a place they love." It sounds uplifting. But, sadly, it is wrong. New Orleans should not be remade. Not the way it was. Dennis Hastert made the point first, three days after the storm, telling the Daily Herald, a suburban Chicago newspaper, that rebuilding "doesn't make sense to me. ... A lot of that place could be bulldozed." He was shouted down as an insensitive defeatist. Jack Shafer soon explained in Slate that poverty, public school failures, the placid acceptance of urban crime, the insurance debacle, and the challenge of protecting a city built in a ten-foot hole would vitiate any settlement there. All fine reasons not to replicate pre-Katrina New Orleans, but none of them truly compelling, because they are secondary. The primary case against restoring New Orleans isn't technocratic; it is moral. Eventually, the "Big One"--the Category Five killer scientists have warned residents to expect for 40 years--will make Katrina look tame. And, if we cannot see that major tracts of New Orleans are still unsafe, it will kill many more people. Those areas should be closed to development. Officials were negligent enough in not preparing for a storm of Katrina's power; why should they let New Orleanians return to harm's way? Although Katrina destroyed much of New Orleans, it was not the Big One. It weakened and passed 30 miles to the east. And, although New Orleans flooded, the cause was not a storm surge that "overtopped" levees--which the Cassandras have always predicted would drown the city--but rather levee collapses along the canals that link the river with Lake Pontchartrain, which empties into the Gulf of Mexico. Those breaches allowed the lake's storm surge (rather than the river's) to flood directly into town. Now New Orleanians are likely to think the worst has come and gone. Not so. When the Big One finally creeps up the Mississippi River delta, it will push a wall of water with it that spills over even the highest river levee. And New Orleans is only becoming more vulnerable, because the wetlands and barrier islands of southern Louisiana--the ones that have always borne the direct onslaught of storms--are eroding at the rate of one acre every 24 minutes, leaving little ground to sap hurricane surges. That makes the Mississippi levee system the only bulwark against the water, which it was never intended to be. 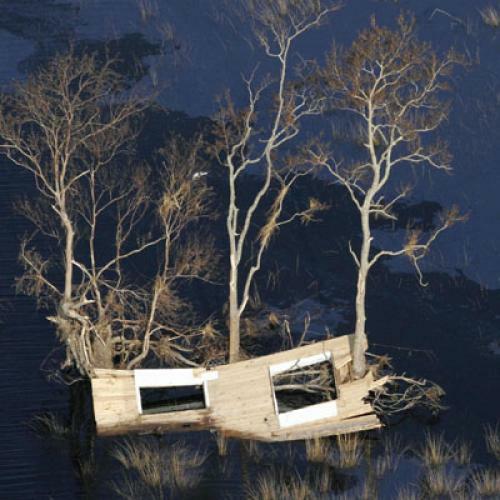 In the wake of Katrina, there's talk of raising the levees to prevent overtopping. But the higher the Army Corps builds them, the faster they will sink into the soft terrain. And, as Columbia University geophysicist Klaus Jacob wrote in The Washington Post, "The higher the defenses, the deeper the floods that will inevitably follow." Idealistic officials think they can devise better evacuation plans. But meteorologists cannot know until just before landfall where a storm will hit, and unnecessary evacuations have a Chicken Little effect, increasing the likelihood that residents will ignore the emergency order when the Big One really does arrive. That's why the mayor didn't evacuate New Orleans until just 21 hours before the storm landed. Furthermore, there is no way to shepherd away the 100,000 New Orleanians who don't own cars in so little time. Pundits have flayed the local, state, and federal governments for not caravanning these people to safety, but there will never be time to conjure 2,500 buses and 2,500 drivers in the tiny window between the knowledge of a storm's path and its arrival. Many New Orleanians survived Katrina on the lucky break that the flooding began only after the storm had passed. They won't be so fortunate again. Nor can other schemes stop the Big One's surge, at least not during the current cycle of vicious hurricane seasons, which is supposed to last another 20 years. The best strategy for reconstituting the prophylactic wetlands is called Coast 2050, because that's the year planners expect it to be done. It calls for rerouting entire estuaries of the Mississippi delta. One civil engineer suggested a Dutch-style network of dams and dykes, but Holland's modern system covers 1,560 miles and was 50 years in the making. Plus, its seawalls do not need to sit in beds of pliant silt or withstand 175-mph squalls. Jacob actually suggested rebuilding New Orleans on a Venetian network of bridges and platforms. These people are fooling themselves, and the obstacle is not cash: Nature simply will not be cowed so easily or so soon. True, not all of New Orleans is in jeopardy, and residents on high ground should not be barred from their homes. The real threat is to the lowest neighborhoods, such as the Ninth Ward and New Orleans East; they are unlike other disaster zones, where structural modifications and insurance policies can mitigate the damage. These neighborhoods are also the poorest and the blackest in the city. It is here that the moral case against consigning imperiled residents to their deaths is strongest. And yet New Orleans cannot exist without workers for the tourism and food-service industries, the ports, and the casinos. So, if there's no safe place to put the city's poor, there's no moral way to rebuild a viable economy. Some talk of relocating the poor nearby-- perhaps across the river--and erecting a vast infrastructure of housing and transportation, enabling them to work in the city if they want. But Katrina's legacy shouldn't be a rich, white New Orleans mirrored by a poor, black shantytown. Cruelly, the storm gave the people with the fewest choices no choice at all; the government must resettle them elsewhere and force those living on high ground to endure the diminished economy or leave. Millions of Americans live in dangerous places, and major cities often undertake risks knowingly. But it is one thing to know of a danger and argue that a fully developed, fully functional place like San Francisco should move away from a fault line; it is something else entirely to face the facts about a city now largely in ruins. It is no easy thing to wish your birthplace out of existence for its own good; the American habit, like with any challenge, is to fight back. But, in the end, demonstrations of perseverance aren't worth nearly as much as the lives they are meant to uplift.